Electrical equipment and machines are the lifeblood of modern industrial operations. From motor changeovers to replacing components in electrical panels, industrial maintenance activities require frequent interaction with electricity. Safeguarding workers and equipment is of paramount importance to machine manufacturers and operators. Even systems specifically designed for industrial use are prone to normal wear and tear,often resulting in insulation breaks and exposed wires. Electrical safety challenges are compounded in a plant where every circuit carries some riskof short circuits that can potentially lead to electric burns, arc flashing and other hazards.While fatal electrocutions pose the most serious threat, any uncontrolled electrical current can cause severe injury. Arc flash incidents harm thousands of people every year at an astronomical cost to companies and their employees. Workers who suffer injuries due to exposure to hazardous energy lose an average of 24 workdays to recuperate. (Source: OSHA Lockout/Tagout Fact Sheet). A major electrical accident can result in debilitating injuries or death. Employers can be fined and held criminally liable if they are found to be negligent in taking safety precautions. procedures to protect workers from the danger of accidental startup of equipment or other exposure to live current. The OSHA standard for Selection and Use of Work Practices (29 CFR 1910.333) provides guidelines for protecting employees who work on electric circuits and equipment. This section requires the use of safe work practices, including LO/TO procedures. The Control of Hazardous Energy standard also (29 CFR 1910.147) addresses LO/TO procedures for de-energizing machinery and equipment before performing inspections, repairs or changeovers. (Source: OSHA Lockout/Tagout Fact Sheet) Employers must develop, implement and enforce an Energy Control Program best suited to their operation and the types of machines and equipment being used. A comprehensive electrical safety program must provide education and training, and the right tools for workers to safely navigate electrical risks, including performing LO/TO of equipment. OSHA estimates show that compliance with LO/TO standard prevents over one hundred fatalities and tens of thousands of injuries annually. One cannot flip a switch and assume a motor or conveyor is fully de-energized. Use of a standard disconnect switch to de-energize equipment generally requires a work permit and a qualified person to turn off power at the switch. The switch is locked in the OFF position before being securely tagged to show the machine status. An important part of the LO/TO procedure is proving that there is no power in the circuit supplying the machine, which can be time consuming. However, taking shortcuts can cause serious ramifications. Power-off confirmation may require opening the switch to manually probe wires using a volt meter to confirm zero power. Rubber gloves, protective helmets and other cumbersome personal protective equipment (PPE) designed to reduce electric shock make accomplishing these critical tasks more challenging. Replacing a simple motor may take an hour or longer. Machine builders, equipment manufacturers and plant operators exploring power connector choices now have the option of a faster LO/TO solution to help protect workers while maximizing production uptime. The Woodhead ArcArrest 30A Switch-Rated System protects against exposure to electrical energy and can be quickly and safely connected or disconnected, with clear visual verification of power-off. ArcArrest plugs and receptacles deliver the performance of a UL listed motor and branch circuit disconnect switch in a compact form. Unlike standard connectors, UL 2682 switch-rated devices can operate as switches and be used to safely disconnect equipment while energized. When operated under load, arcing will occur between male and female contacts. Spring-loaded silver-nickel contacts provide switching capabilities similar to a switch or contactor. Silver-nickel is a proven electrical switching material able to withstand thousands of arcing cycles without degradation. The spring-loaded contacts also provide a low resistance connection. The receptacle safety shutter and arc chambers contained within heavy insulators assure that ArcArrest users are not at risk of exposure to arcing or live components. The two-step connector operation places the plug in a rest position after disconnection, requiring a rotating motion to remove the plug while simultaneously closing the receptacle shutter. 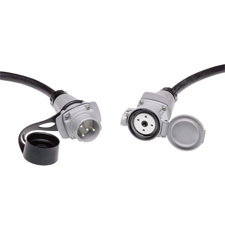 The solution meets NEC and OSHA requirements for a lockable line-of-sight disconnect within 50’ or less of a motor. The positive and quick LO/TO system can safely disconnect equipment—using the separation of the plug from the receptacle as proof-positive power is removed.